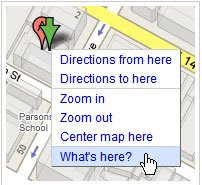 Google has added a new feature to the right-click menu on Google Maps. The new feature, ‘What’s here?’, when clicked, will give you the most relevant results representing a location, whether it’s a specific address, a natural entity, or a place name. The results are related to the zoom level that you click at. For example, if you click on New York when you are zoomed out on the map you will get result for the state of New York. This vector art graphic design like Free Vector Map of USA with State Names, in Adobe Illustrator and PDF can also be useful. Zoom in closer and you will get results for the district of New York you are clicking on, zoom in closely and you will get address of the location.